“Well I guess they consider me the canoe builder but most often I don’t build a canoe all by myself. Sometimes, other people are just interested. Friends, whathaveyou, various people just come by. And I guess I end up being more like the choreographer of the canoe-building event, if you wanna look at it that way.” begins Grant Goltz, Woodworker and Archaeologist from Minnesota. The builders begin by collecting and processing spruce roots. They need to produce 500-600 feet of lacing. One of the visiting builders in the above video is Kevin Brownlee, who is the Curator of Archaeology at the Manitoba Museum in Winnipeg. You can hear an interview with Kevin Brownlee on the Paul Kirtley Podcast, where he talks about how this canoe build came about, along with many other aspects of his work. Once the spruce bark is sorted, they being work on the birch bark, first cleaning it up. Then a frame is overlaid and the birch bark shaping is begun, using the fame. Jim Jones is one of the other builders in this video. He’s a Leech Lake Band member of Cass Lake, Minnesota. His Anishinaabee name translates to “Flowing Creek”, which his grandfather gave to him because he said he was always on the go. It seems to us it’s also a fitting name for a canoe-builder! 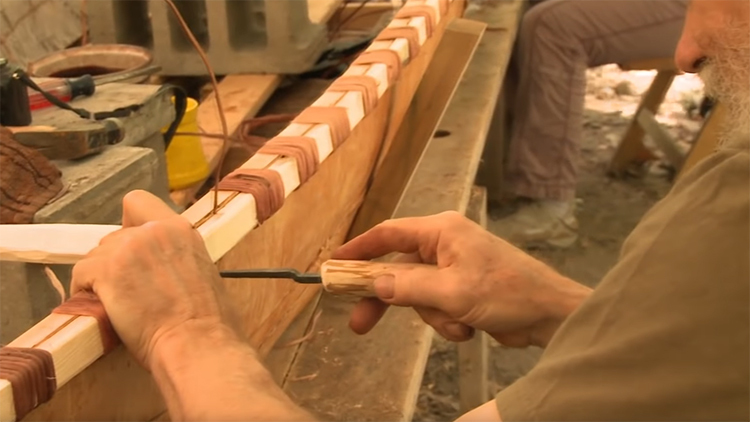 And so in this video, this small group build a traditional birch bark canoe, a craft of incredible beauty and design. It’s an involved process, though, taking multiple days. “Being part of that building and watching her come together. It’s a connection and a bond with develop with each boat that we build, because part of us goes into these pieces. And that’s what I enjoy out of building these canoes here, it’s what we share and what we put into it.”, explains Jones. What’s even more wonderful about this build is that the canoe is a wedding gift to Kevin Brownlee and Myra Sitchon, both of whom also helped build it. As well as the personal aspects of this canoe build, there is also a professional perspective. “Most of us working on this project are archaeologists by training. We always try to figure out what was going on in the past and how people did things in the past. It humanises our work and makes it more interesting to me as an archaeologist and to the First Nation or tribal groups in northern Manitoba. I think that’s just great to get that across to them, that the human side of it. Just the process of doing it; how many hundreds or thousands of years have people been peeling roots, preparing birch bark, doing exactly what we’re doing?” wonders Brownlee. Got to you via a Paul Kirtley link, as Grant Goltz says this is artwork, it is a piece of art that I would gladly have mounted on my lounge wall, I hope the craft never dies.